Hello wine lovers and happy wine Wednesday! I have to admit that I have not had a sip of wine for an entire week – not because I didn’t want to but because I had some crazy dental surgery that left me a bit strung out on antibiotics and pain medication. Happy to say that it is all behind me now. In the whirlwind that was last week, I did not do service to the beautiful region of the Loire Valley – the place that is lovingly referred to as “France’s Garden”. Sadly, I have not traveled to this part of France (yet) but ohhhhh – do I want to go! I now have an even greater appreciation of the Loire Valley’s main grape varieties – Chenin Blanc, Sauvignon Blanc and Muscadet for the whites and Cabernet Franc in the red department. Sauvignon Blanc’s home is here, in the Loire, and it expresses itself more elegantly, in my opinion, than a straight up New Zealand SB. The flavours of the Loire Valley Sauvignon Blanc, specifically Sancerre and Pouilly-Fumé, are more in tune with mineral notes of gunflint, celery, grapefruit, freshly cut grass and lemon. You are not hit over the head as you are sometimes with the New Zealand overtly herbaceous and some say ‘cat pee’ flavour profile. Chenin Blanc is made into both dry and sweet wine in the Loire. It is a hardy and resistant grape that can be made into succulent sweet wines with botrytis infected grapes – look for flavours of peach, apricot, quince and pear. if you have not tasted much Chenin Blanc, my suggestion is to go out to your local specialty wine store and ask them to refer a great French option for you. There is value in this grape variety and it is something a bit out of the ordinary! Cabernet Franc, the black grape of the Loire, shines here more than anywhere else in the world. It can ripen in cooler climates and the Loire, especially the Middle Loire around Anjou and Touraine, is that ‘sweet spot’ for this grape. Look for tasting notes of tree bark, forest floor, cocoa, violet and cranberry. Again – not a hugely popular grape in North America but B.C.’s Okanagan Valley can produce a nice example of this grape as well. Monnières Saint-Flacre 2007 Muscadet Sèvre et Maine (12.5%) $26.99 2007 was a fantastic vintage in France. This Lower Loire wine is no exception! Fantastic flavour profile of lemon and lime with a whiff of salt. A fantastic and classic pairing with seafood. You can buy this at Liberty. Serge Dagueneau & Filles 2010 ‘Clos des Chaudoux’ Pouilly-Fumé AOC (13%) $42.99 OK you Sauvignon Blanc fans out there – and I know you are many – here is a slam dunk for a beautiful and I mean beautiful expression of SB. From this highly regarded producer, this Pouilly-Fumé (which is always a Sauvignon Blanc) is a stunner. Amazing flavours of grapefruit and asparagus with a searing acidity that is balanced with great complexity and a long finish. This wine blew my mind and it is available at the B.C. Liquor Stores. Yes – it is pricey but here is a great ‘birthday’ bottle for a special someone. Château de Sancerre 2010 Sancerre Rouge AOC (13%) $45.99 This bottle was a Pinot Noir, which is the black grape variety of the Upper Loire. There was some acid, some spice, a bit of raspberry, cherry and violet. I was underwhelmed by this wine and certainly did not think it was worth even half the money. Champalou 2010 Vouvray AOC (12.5%) $32.99 Sweet fancy Nancy! This was another great wine! It was off-dry, just by a bit, with gorgeous notes of floral, quince and apple. It had amazing acidity that would cut through fat in a pork dish, for example. YUM – buy it at Liberty. Charles Joguet 2009 ‘Cuvée Terroir’ Chinon AOC $31.95 This was our Cabernet Franc example. To me, it needed food to be better enjoyed. It had green, ‘grippy’ tannins, with herbaceous notes and black currant. It was a bit too astringent for me, personally. Domaine des Baumard 2008 ‘Clos du Papillon’ Savenières AOC (14%) $44.99 This was another amazing example of Chenin Blanc. It was vinified dry with overripe Chenin Blanc grapes. It had great minerality, celery notes with medium acidity. This has another 10 years to age and is one of the most age-worthy AOC’s in the Loire for the Chenin Blanc grape. Perfect with a creamy wild mushroom paté – heaven. 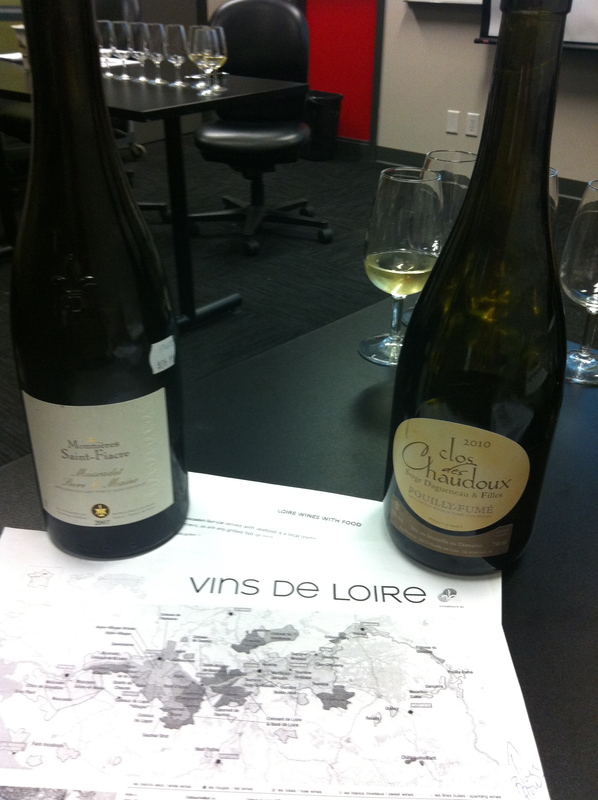 As you can tell, my Loire Valley class was a winner. So many delicious wines that evening and it was nice as it was our last class before our exam. I had such a great time in this class and am a bit sad to say that it is completed. I am awaiting my grade and expect it sometime next month. I learned an incredible amount of information not only about grapes but about France and its history. I, again, would strongly recommend this class for any wine lover out there. It is suggested that you have a minimum of your WSET Level 2 before taking this course, however. I know I would have been overwhelmed if I didn’t have the knowledge I did going into the class. I am still debating which French Wine Master class I embark on next…I think either Alsace or Rhône are the likely candidates but Burgundy is also looking tempting. Oh well, looks like I may just stay in school for a long time! I am great with that! Could you recommend some French Chenin Blancs, and Muscadet wines that are available at BC Liquor Stores that you love? Yes – let me do some digging and I will get back to you ASAP! Thank you. Muscadet Sevre et Maine Haut Censy 2012 $15.95 – pair with simple seafood. Thanks for you recommendations!I found this Chenin that I really love—Saumur Les Pouches 2012—do try it!